Often, resource planning is a multi-level process. The sales department is making forecasts based on the current resource schedule to prepare proposals for new projects. After being assigned to projects, the project managers do the initial resource allocation or build the work breakdown structure without assigning the tasks to resources. Once the tasks are assigned, the general resources manager has to make sure that resource utilization is optimal across the board and make changes when needed. Even after that, changes will be made to the schedule over time. To keep up with the whole resource management process, one constantly needs to check the schedule to get an overview. Even attending weekly resource planning meetings might not be enough to stay in the loop. For a manager, who has to make sure their team can do what they do best, it's an inevitable part of the job. However, for a team member, who is mostly concerned with their own schedule and how the workflow is intertwined with others, constantly checking the schedule might be too much of a hassle. This is why we are introducing reminders and notifications for resources. You will receive the alerts that you have set up via email. Both - reminders and notifications - can be set and edited in the resource window. You can add reminders and notification to the resource you have the rights to edit or view. I.e. all the resources you can see in the planner. The first part of the update is reminders. You can set to get a reminder before the start time of the tasks or before the end time of the tasks assigned to a specific resource. You can also add a reminder for both the start and the end time or use another specific date as a trigger. But that's far from being all. As it has always been, in Ganttic, your data is the limit. You can add conditions based on the custom data added to the tasks. You can use user, date, and list-type of custom data to set the conditions. If you are yet to get into the magic that is using custom data in Ganttic, move over to our helpdesk to learn how to add custom data to tasks. That way, you can control the flow of reminders and only get a reminder when the conditions are right. For example, you can set to get a reminder only when a specific user has added a task to the resource's timeline and only when the task status is set to "Active". Or you can only get a reminder when the project manager isn't a specific user or a specific status. And of course – you can add multiple conditions to one reminder to get it just right. If you want to receive reminders about a specific date during the task and not just the start or end time, use date-type custom data to add the date and use it as a trigger for the reminder. In addition to reminders, you can add notifications. Since the resource schedule is ever-changing, there are a lot more options to create notifications. You can be notified once a new task is assigned to the resource, a previously added task is edited, a task is removed or when a note is added to a task that is assigned to the resource. And you can add conditions to the notifications as you can to reminders. For example, you can add a condition to get notified when someone edits the tasks if the task status is "Active". That way, when the tasks are still in the planning phase and are constantly updated, you won't get numerous notifications about the changes that aren't final. There's also an option for those of you that don't have the kind of system in place where you use list-type custom data to keep track of task statuses. You can use the feature that enables you to start receiving the notifications only when there's a specific time period left until the start time of the tasks. If you don't want to receive notification about the changes that you make yourself, make sure to check the box that triggers the notifications only when the other users are making the edits. 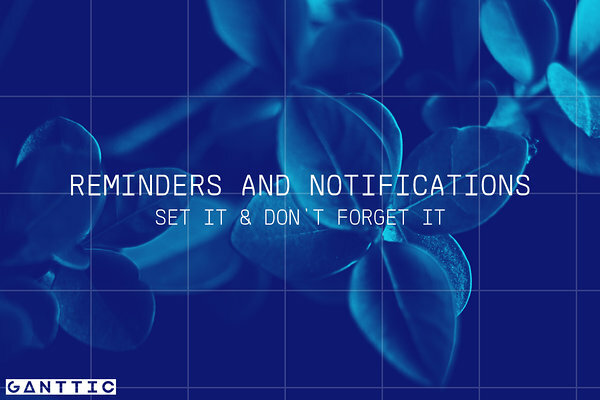 Although reminders and notifications are a good way to stay in the loop, we still recommend you to only add the kind of alerts that you really need. It's easy to fill your inbox with various automated emails that promise to help you. However, they might do just the opposite by overwhelming you with too much information. Sometimes, less is more. A few well-thought-out reminders and notifications can help you out more than ten of each would.